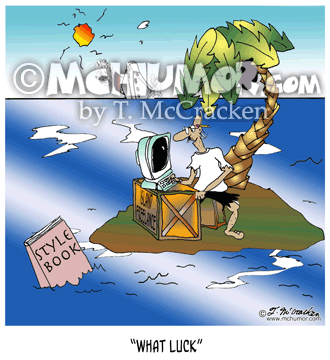 Writing Cartoon 7195: Someone sitting at a desk while stranded on a desert island upon seeing a Style Book wash up on shore cries, "What luck!" 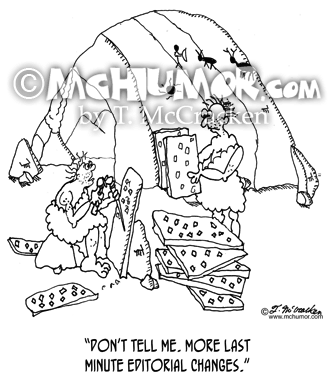 Editor Cartoon 7711: A caveman chiseling stone tablets saying to another man who's bringing him tablets, "Don't tell me. 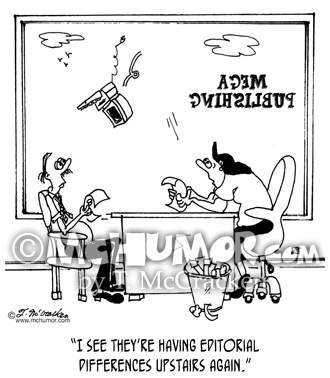 More last minute editorial changes." 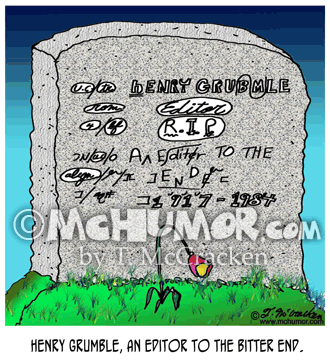 Editor Cartoon 1447: A tombstone with editorial symbols making corrections reads: "Henry Grumble, an editor to the bitter end." 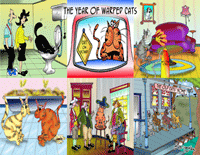 Crossword Cartoon 6423: "Tiling the Bathroom for the Crossword Puzzle Editor." 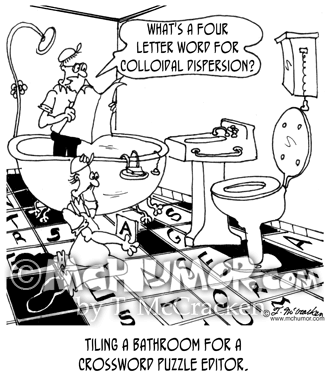 As one man kneels on a bathroom floor tiling using letters, another stands in the bath tub reading a newspaper and asks, "What's a four letter word for colloidal dispersion?" 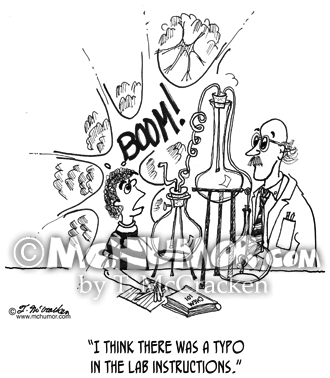 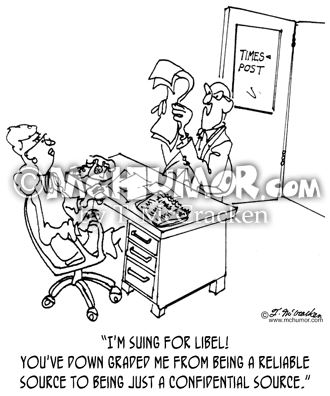 Editor Cartoon 1240: A man saying to an editor, "I'm suing for libel! 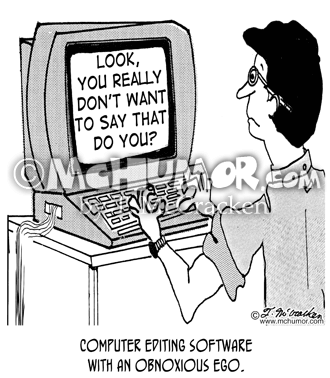 You've down graded me from being a reliable source to being just a confidential source." 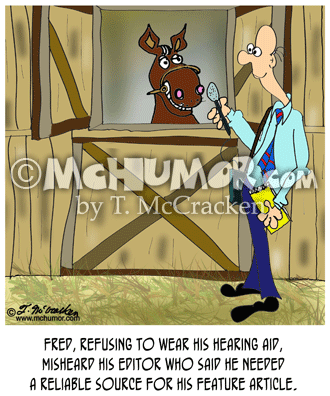 Horse Cartoon 8609: A reporter interviews a horse. 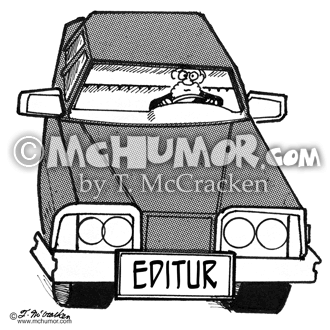 "Fred, refusing to wear his hearing aid, misheard his editor who said he needed a reliable source for his feature article."